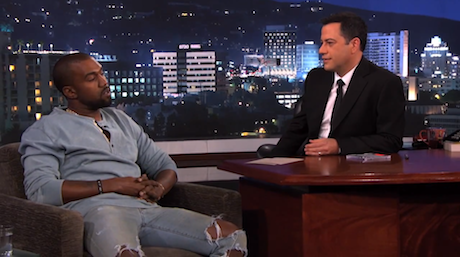 Kanye West's recent appearance on BBC Radio 1 was the subject of a Jimmy Kimmel Live! sketch that didn't sit well with the rapper last month, eventually inspiring a Twitter rampage against Kimmel. To discuss the reason for the beef, West was treated to a lengthy interview segment on Kimmel's program. The interview ate up much of Kimmel's show (sorry, Arctic Monkeys), and saw Kanye discussing everything from his aspirations in the fashion world to what was going through his head when making those tweets. Ye credits his inability to launch a fashion line to the "classism" of the fashion industry, and also expressed frustration that Kim Kardashian won't be treated to a star on the Hollywood Walk of Fame. Kanye went on to discuss the paparazzi, idols like Da Vinci, Steve Jobs, Walt Disney and Jesus, and even admitted that he sees himself as a "creative genius." He also denied any allegations that the Kimmel beef was a publicity stunt, pointing out that he doesn't take advice from publicists.